Twitter is a web-based micro-blogging service that defines itself as “a service for friends, family, and co-workers to communicate and stay connected through the exchange of quick, frequent messages.”1 Messages take the form of ‘Tweets’, which are a maximum of 280 characters long and may include photos, video or links to other websites, and may contain a ‘hashtag’ (e.g. #CardioEd) to help users find particular topics. Anyone can create a free Twitter account, and then start ‘following’ other accounts that they find interesting and, in turn, be ‘followed’ by individuals who are interested in their Tweets. An active Twitter presence has been said to provide opportunities for continuing medical education, patient education, personal branding and reputation management.2 The engagement of cardiologists with Twitter is increasing, as evidenced by 2017’s European Society of Cardiology (ESC) Congress, during which more than 49,000 Tweets were made, and 306 million impressions, which are interactions with the Tweets, were recorded for the #ESCCongress hashtag. This was described as a record for a healthcare conference.3 This article looks at the demographics of UK cardiologists who currently use Twitter and what they Tweet about, and discusses current General Medical Council (GMC) guidelines regarding doctors’ use of social media. The aim was to identify the number of UK cardiologists using Twitter, who were the most influential UK cardiologists on Twitter, and what they Tweet about. UK cardiologists were defined as cardiology consultants, registrars or fellows, or medical doctors undertaking cardiological research. The British Cardiovascular Society’s (BCS’s) Twitter account (@BritishCardioSo) was arbitrarily chosen as the starting point to identify individuals. 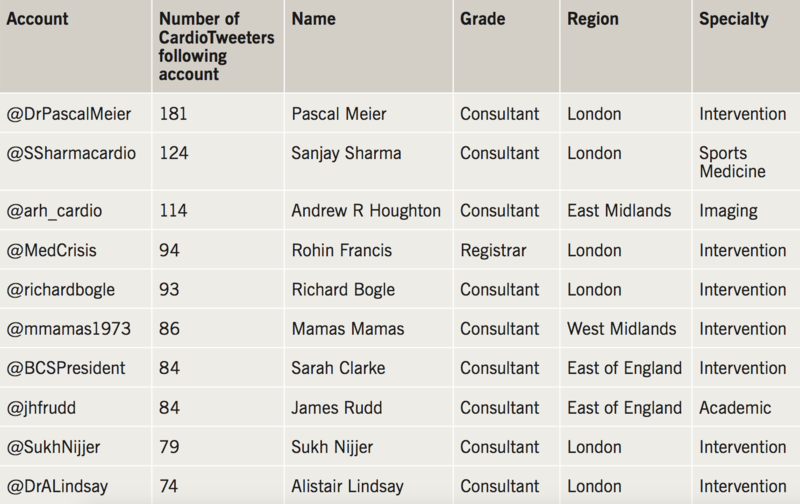 Twitonomy,4 a programme to aide analysis of Twitter, was used to download a list of Twitter accounts followed by @BritishCardioSo and the accounts on this list were manually reviewed to identify UK cardiologists. This produced a starting cohort of 36. The ‘following’ of this cohort were then downloaded (with one excluded due to numerical limitations as following over 121,000 accounts) and Excel used to filter the ‘following’ list to find accounts being followed by at least four accounts of the starting cohort. 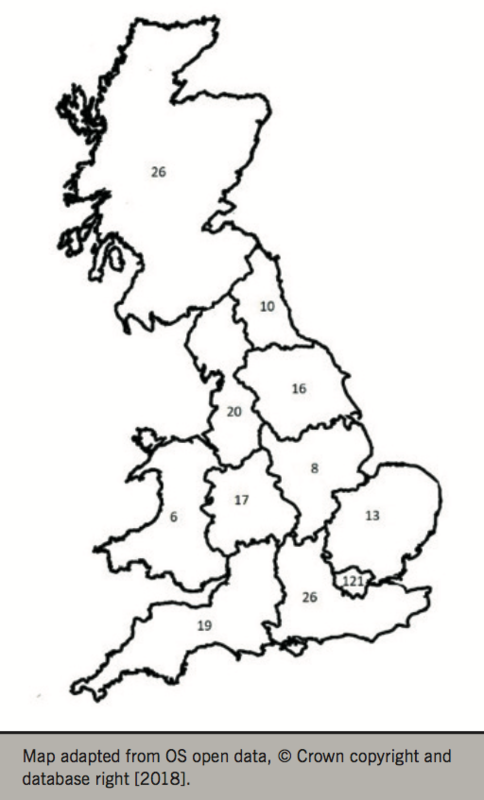 This filtered list was manually reviewed to identify UK cardiologists, creating a second cohort of 112. Five of these accounts were protected (i.e. the user restricted who can view their information) giving a second cohort to be analysed of 107. The ‘following’ of cohort two was then collected and combined with the following of cohort one before being filtered to find accounts followed by at least four cohort accounts. 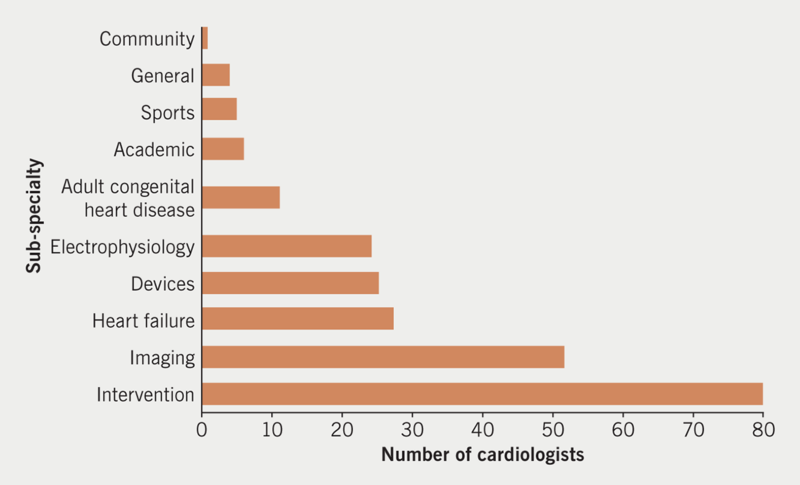 This iterative process continued until no more new UK cardiologists were identified, at which point the overall following list was analysed once again and filtered for those followed by three, and the iterative process restarted. All data were collected in October 2017. The job title, specialty and location of the cardiologists were identified via information provided in their Twitter biography, the GMC register,5 LinkedIn,6 hospital and university websites. Not all of this information could be ascertained for every individual and it has not been independently verified. Analysis of the data collected was performed using Excel. The 10 UK cardiologists on Twitter followed by the most other UK CardioTweeters were identified and their last 20 Tweets from October 2017 analysed to give insight into the content of UK CardioTwitter. There were 302 UK-based cardiologists identified, one of which represented a duplicate (BCS president account/personal BCS president account) leaving 301 unique individuals: 11 accounts were protected, which limited further analysis. The majority (63%) of CardioTweeters were consultants (figure 1) and the most common location of CardioTweeters was London (41%) (figure 2). The most commonly represented sub-specialty was intervention (79 accounts) followed by imaging (51) and heart failure (27) (figure 3). The majority (85%) were male. 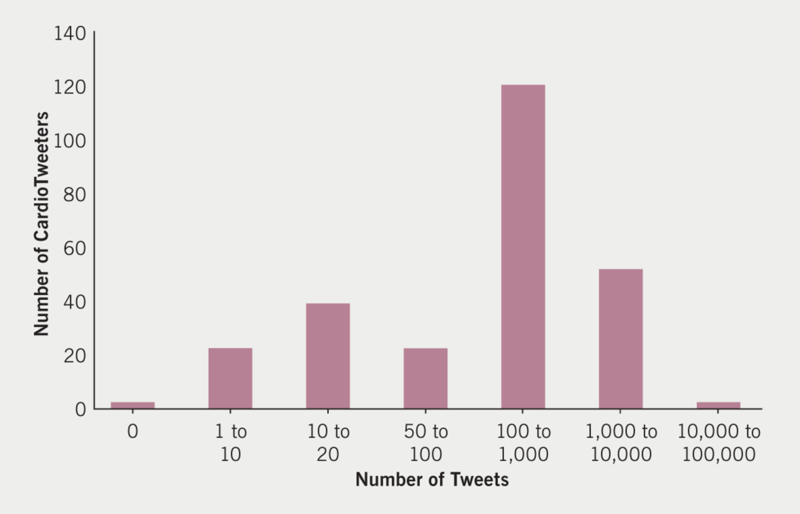 Nearly-three quarters of CardioTweeters had tweeted within the past month (figure 4). The majority (72%) had Tweeted over 100 times, with a range from 0 to 56,649 Tweets (figure 5); mean number of Tweets 1,611 and median 178. The most followed account by UK CardioTweeters is the ESC (@escardio) followed by other predictable cardiology resources (table 1). 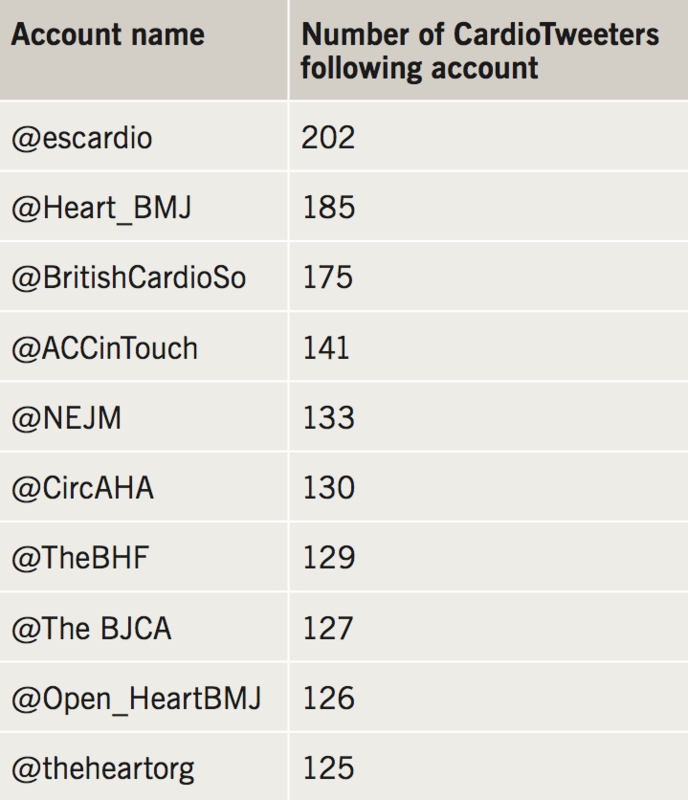 The CardioTweeters most followed by other UK CardioTweeters are shown in table 2, and shows a preponderance of interventional cardiologists. Away from work, Barack Obama is the most followed Twitter account (table 3). Analysis of the last 20 Tweets of the 10 UK cardiologists most followed by other UK CardioTweeters revealed that 64% of Tweets related directly to cardiology, and 80% related to cardiology/medicine/science. Raising awareness of journal articles occurred in 16% of Tweets, and 100% of these had hyperlinks to allow easy reading of the whole article. A further 22% were sharing information from cardiology meetings or conferences. Only 12% of Tweets were classified as ‘social’, the majority of which represented interactions between members of the CardioTwitter community that did not directly relate to cardiology, for example sharing of Halloween pumpkins carved with coronary arteries. ‘Retweets’ made up 70% of Tweets, meaning someone else’s Tweet was being shared to propagate its content further. Twitter has so far been adopted by a relatively small percentage of UK cardiologists, with the number of consultants identified representing around 6.5% of UK consultant members of the BCS. However, those that have engaged appear to find it beneficial, as evidenced by the majority actively participating within the past month and most having Tweeted more than 100 times. The benefits of participating are myriad, and other articles looking at use of Twitter by doctors have highlighted the opportunities for continuing education, crowd-sourcing and sharing information, access to experts and peers across the globe, networking and personal branding opportunities.2,7 The content of Tweets analysed in this article suggest UK cardiologists Twitter usage reflects this. An article co-authored after the 2017 Transcatheter Cardiology Therapeutics (TCT) meeting by Mamas A Mamas, a UK interventional cardiologist, prolific CardioTwitterer and sixth most followed UK cardiologist by other UK cardiologists, discussed how Twitter has revolutionised the transmission of knowledge from medical conferences to the global arena, and allows cardiologists to keep abreast of the rapidly evolving evidence base by facilitating the dissemination of scientific literature in an easy to digest format. It also notes the benefit of facilitating direct access to researchers who published the work, allowing interaction and feedback.8 The analysis of Tweets for this article covered the period that TCT was occurring and illustrated this sharing of conference information, and the dissemination of scientific literature was also demonstrated by 16% of Tweets sharing snippets of journal articles. It also highlighted the networking and mentorship opportunities that Twitter offers, which is reflected by the 12% of Tweets that were classified as ‘social’ but were, in general, interactions creating bonds between cardiologists. When other UK cardiologists in the ‘top 10’ were asked why they use Twitter, similar themes to those identified by Mamas A Mamas appeared. Richard Bogle, an interventional cardiologist ranked fifth, commented on how Twitter was a source of new and interesting information, also praising the immediacy of interactions, and how the ability to post images and movies facilitated lively discussions with cardiologists worldwide. Rohin Francis, the only registrar in the top 10, explained his original reason for engagement was political during the junior doctor contract negotiations, highlighting Twitter’s utility in raising awareness of issues to a wider audience than could be reached by more conventional methods. However, he states, he continued to use Twitter after discovering it to be a “tremendously powerful tool for education”. He lists many benefits he has gained from Twitter use, including collaborating on projects and articles, getting highlights of journals and the opinions of leading luminaries and clinical cardiologists, and networking with doctors, scientists and journalists, leading to new opportunities. Overall, available evidence suggests Twitter usage should be promoted among UK cardiologists. It offers a location-independent and time-efficient way to stay informed of developments in the world of cardiology, is free and easy to use and offers opportunity for networking and mentorship. 1. Twitter. New user FAQ. Available at: https://help.twitter.com/en/new-user-faq [accessed 30 December 2017]. 4. Twitonomy. Twitter #analytics and much more… Available at: https://www.twitonomy.com/ [accessed 31 October 2017]. 5. General Medical Council. The medical register. Available from: https://www.gmc-uk.org/doctors/register/LRMP.asp [accessed 30 December 2017]. 6. LinkedIn. Available at: https://www.linkedin.com [accessed 30 December 2017]. 8. Mamas MA, Anaslag M. Interventional cardiology in the Twitterverse. 29 November 2017. Available from: https://cardiovascularnews.com/interventional-cardiology-twitterverse/ [accessed 30 December 2017]. 10. General Medical Council. Making and using visual and audio recordings of patients. Recordings for which separate consent is not required. Available from: https://www.gmc-uk.org/guidance/ethical_guidance/7840.asp [accessed 30 December 2017]. 11. General Medical Council. Doctors’ use of social media. Available from: https://www.gmc-uk.org/guidance/ethical_guidance/30173.asp [accessed 30 December 2017].